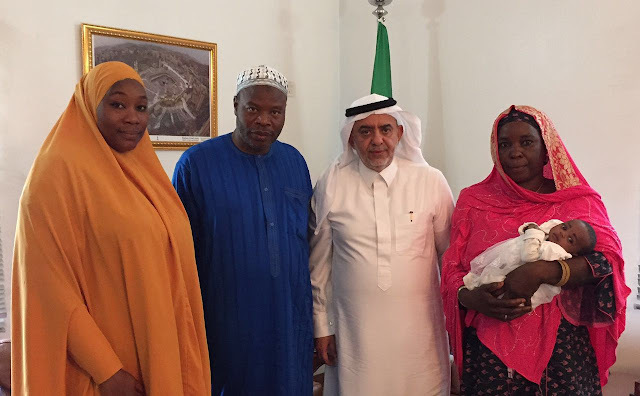 His Excellency, Sheikh Fahad Abdullah Sefyan, the Ambassador of the Kingdom of Saudi Arabia in Nigeria, conversed with me over mobile-phone concerning an article published on page 16 of Saturday Trust (August 13th, 2016), captioned ‘Meet Kaduna Lady Who’s Raising 5 Abandoned Babies.’ His Excellency asked me if I had read the report. ‘No, I have not, but I have the paper, Your Excellency.’ I answered. He said he will send the image of the pages of the report to me by WhatsApp; that he wanted me to get in touch with the ‘Kaduna Lady’ for his 'widow’s mite' on what she is doing. The story was on Hajiya Uwani Yusuf Waziri, also known as ‘Uwar Marayu’ (Guardian of Orphans), a resident of Umguwar Kaji, Kaduna. Though Uwar Marayu, a mother of 11 children, lives in straitened circumstances, she has consecrated her life to taking care of abandoned babies. Whenever such babies are discovered within Rigachikum, Barakallahu, Hayin Na Iya, etc., under bridges or culverts they are brought to Hakimi, the District Head who sends them to their Guardian, Hajiya Uwani, Uwar Marayu. I was in Kaduna at the time and so it was easy to establish contact, through a good friend of mine, Dr. Mahdi Shehu, Chairman, CEO, Dialogue Global Links, with Maryam Ahmadu-Suka, who co-authored the story with Ra’afat Maccido. Consequently, Wednesday, August 17th, 2016 was fixed for a brief meeting with the Saudi Ambassador to Nigeria in the Embassy in Abuja by 11am. Then suddenly I realised that his face darkened, and his eyes reddened and moistened. The Ambassador was trying to speak but his voice was failing him. I passed the tissue box on the table to him that he may wipe away the trickling tears. All of us - Maryam, the report, Hajiya Uwani, Umar Marayu, and I, the English/Hausa Translator - could not control ourselves; even the infant, as if she knew what was happening, started to cry. Hajiya Uwani hushed her with milk in the feeding-bottle. His Excellency said Hajiya Uwani is a model for other women in Nigeria, and her reward is limitless. ‘Whoever removes a worldly grief from others,’ he said, ‘Allah will remove from him one of the griefs of the Day of Judgement. You are a guardian of orphans in spite of your simple background, but don’t forget the Hadeeth, ‘I and the guardian, caretaker of the orphan will be in the Garden, will enter Paradise together like that', (raising, in order to illustrate the meaning, his forefinger and middle finger jointly, leaving no space in between). 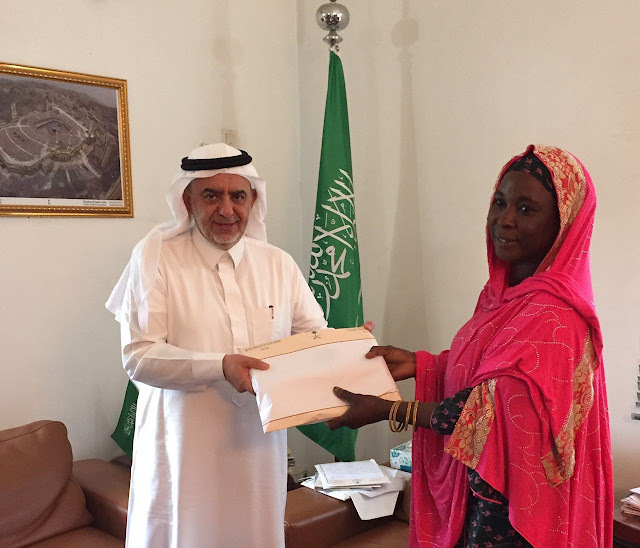 After his short admonition the Ambassador presented his ‘widow’s mite’ to Hajiya Umani which he pleaded not to be mentioned in anyway; but what His Excellency gave for the orphans, I must say, is more than the meaning of widow’s mite. I will describe it as handsome or, better still, ample sadaqah for which Allah, whose countenance he sought, shall recompense him amply. 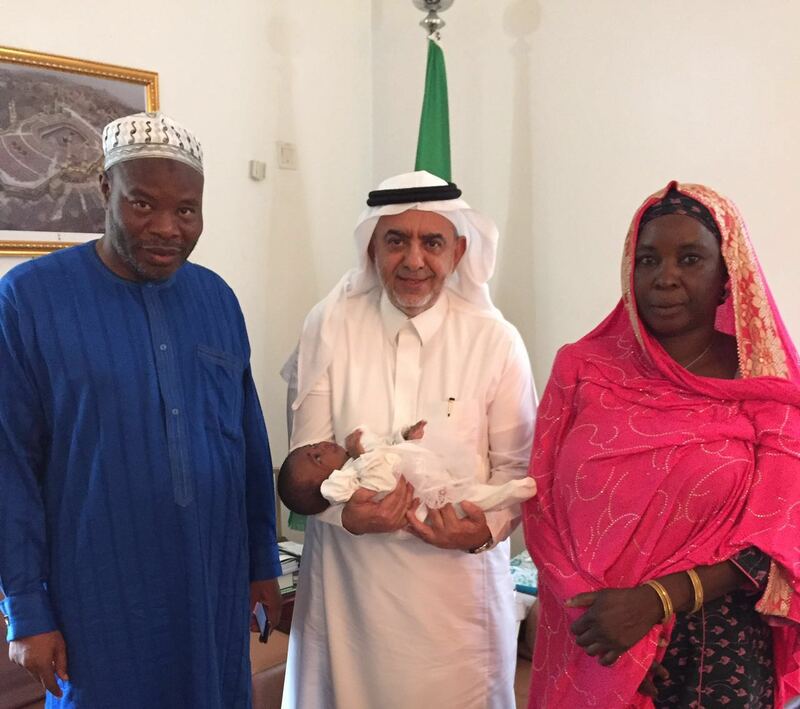 Maryam Ahmadu Suka, Ustaz Abubakr Siddeeq Muhammad, Saudi Arabian Ambassador, and Hajiya Uwani, Uwar Marayu.